A major deity of Germanic peoples, Oden or Odin, is said to be buried on Osmussaar island. In the legends he was escorted by two ravens, Hugin (Thought) and Munin (Memory); their duty was to report to their master what was happening in the world. 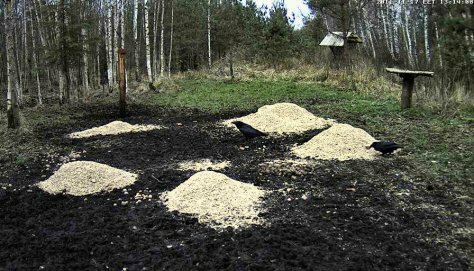 Who knows, maybe our ravens carry on the genes of Hugin and Munin? In all cultures in the world ravens have been associated with magic and witchcraft. The clever birds, once only known from large woods and primeval forests, now manage everywhere. They are mainly sedentary birds and stay in place the whole year. Wintertime immigrants are numerous and the raven population becomes 5-10 times larger, reaching up to 40 000 birds. As regards plumage females and males are similar and the pairs keep together throughout the year. Old males are somewhat larger than the others.